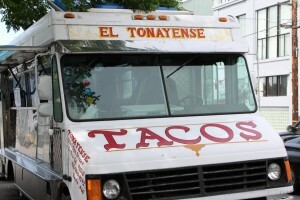 El Tonayense Taco Truck’s New View ? Abandoned lime wedges near the parking lot of John O’Connell High School show that the popular El Tonayense taco truck can still be found operating behind the school. But the owner of the truck, Benjamin Santana told Mission Loc@l that by next week his taco patrons will have to walk north a block to place their orders of tacos de carne asada. “We are still negotiating the details but it looks like we will have to move the truck between 20 – 40 feet towards the 2300 block of Harrison,” he said. The new location would put the truck across the street from Mission Cliffs, the place, Santana said, where most of his customers come from. He added that his new location “has more of a view” than another proposal that would move him near the PG&E building. 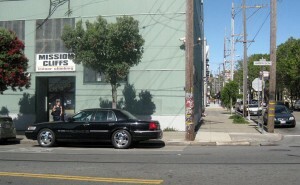 At present, his truck is parked on Harrison Street in back of John O’Connell High School. The school nutrition committee, he said, did not like having a taco truck so close to the school’s back fence. The entrance to the high school, which is book ended by Rosy’s Restaurant on the north end and El Faro’s Mexican Food on the south end, is on Folsom Street. The new location will put El Tonayense slightly closer to Rosy’s but the owner, Rosy Herrera said she had no problem with that. “Each of us has our own clients,” she said Friday afternoon. Mission Loc@l reported earlier this year that a new city ordinance prohibits catering trucks to be within 1,500 feet of a school. The ordinance, combined with complaints from school nutrition groups forced Santana into messy negotiations with the school district and the Board of Supervisors about whether he could keep the truck operating in the same location it has been in for the last 13 years. Santana’s lawyer, Stephen Williams confirmed the proposed location and added that while no official announcement had been made, it was likely to be accepted. “It’s finally the police permit department that determines these things and they are fine with it,” he said. However, the taco war got so heated in the spring, he said, that the city is probably testing the political waters to see if everyone is happy. Williams said Hydra Mendoza, a member of the San Francisco Unified School District’s Board of Education, helped mediate the negotiations with the parent nutrition group that wanted the popular taco truck moved. Mendoza could not be reached for comment. Williams said the problem stated when the city passed the ordinance without notifying the Santana brothers who were there first and who would be directly affected by the new rule. At the time of the Board of Appeals hearing in April, the members decided that the school district and the taco truck should negotiate a solution. A final decision is supposed to be made by Tuesday June 9. Lydia Chávez contributed to this report.